Signature :(Kikumon) TAKAI ECHIZEN KAMI MINAMOTO RAI NOBUYOSHI. Habaki : Shakudo hitoe habaki. Blade length : 56 cm or 22.04 inches. Sori : 1.515 cm or 0.59 inches. Kasane : 0.8 cm or 0.31 inches. and longer kissaki nice looking shape. On the front, Kenmaki ryu is engraved. Hamon : Niedeki suguha with rather thick nioikuchi bright and clear. of first genertation Kyo Shinano kami Nobuyoshi. and Suguha with deep Nioikuchi. 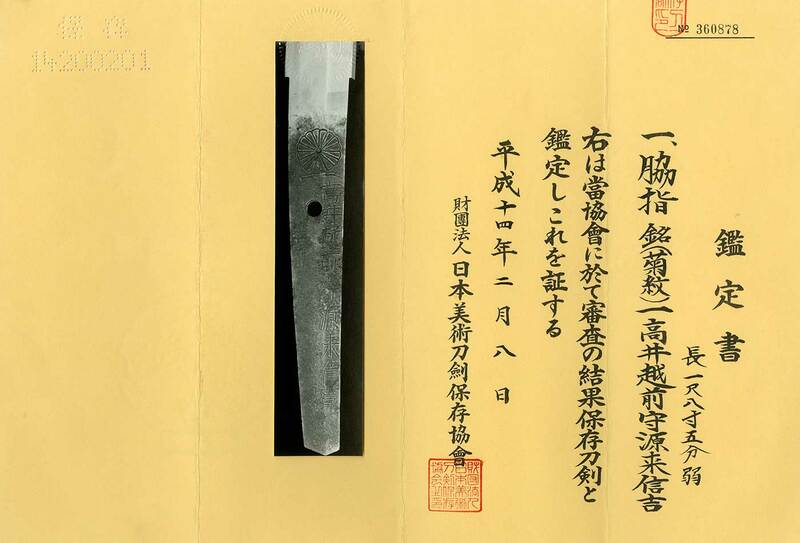 “Takai Echizen no kami Minamoto no Nobuyoshi”. because there is “Kikumon Ichi” in signature. Tsuba : Mokko shape, silver Tsuba, wave and Mitsudomoe family crest are engraved. Fuchikashirai : On the syakudo plate, waves and a dragon are engraved with gold color. Menuki: I think the menuki looks solid gold but not guarantee. and strongly influenced Sukehiro and Inoue Shinkai with deep suguha and do-ranba hamon. This blade is suguha hamon bright and clear with thick nioikuchi. On the front a Kenmaki ryu is engraved later generation. Kosirae is nice combination of the Ko-dogu. Menuki looks solid gold but not guarantee.